The life of the beloved Eldress Theosemni is a Synaxarion account of perfection in self-emptying and martyric asceticism in silence and humility. Her personage and her venerable example cannot be appreciated through the description and listing of her virtues, for it is impossible to explain, through words, the balance and grace of a person who spoke through her silence. The Eldress Theosemni, Anastasia-Aristea Dimtsa in the world, was born in Larissa in the year 1938, the third child of pious parents. When she was just four years old, she lost her father and the care of the family fell to its newly widowed mother, who was from Eastern Romylia and was wholly dedicated to God. From the time she was a child, she received profound love from Christ and the Church, and she would hasten to attend the services and all-night vigils with a zeal that was unusual for her age. She also participated with great zeal in the youth activities at church and, from a very early age, expressed her desire to serve as a missionary. She studied at the Red Cross’s School for Nursing, from which she graduated with highest honors. She chose this path out of zeal to serve humans in pain. In 1966 she became a nun at Meteora. It is widely agreed that her monastic path was a model of obedience and asceticism. Unforeseen difficulties arose at that time, at the beginning of her monastic path, with which she dealt prudently, quietly, and humbly. 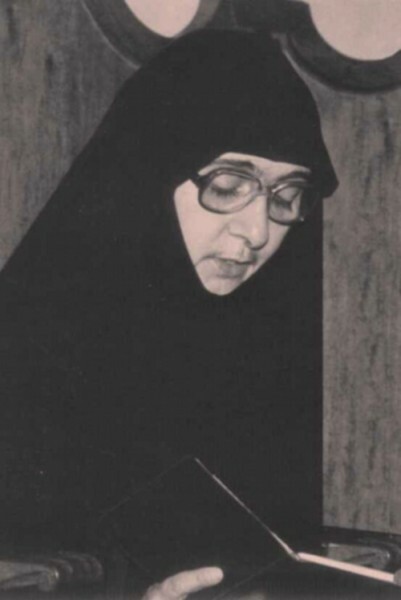 In 1976, Eldress Theosemni went to Hania (Crete) with two other nuns and, with the blessing of his eminence Metropolitan Irenaeus of Kydonia and Apokoronos, she took on the reconstruction, from its foundation, of the ruined Chrysopigi Monastery. Over the course of twenty-four years she worked in silence, with perfect self-renunciation. Her spiritual presence and her ascetic example encouraged many souls to dedicate their lives to the Bridegroom Christ, and she led them and established them in the Lord. The abbess was an ascetic, a lover of struggle, and prudent. 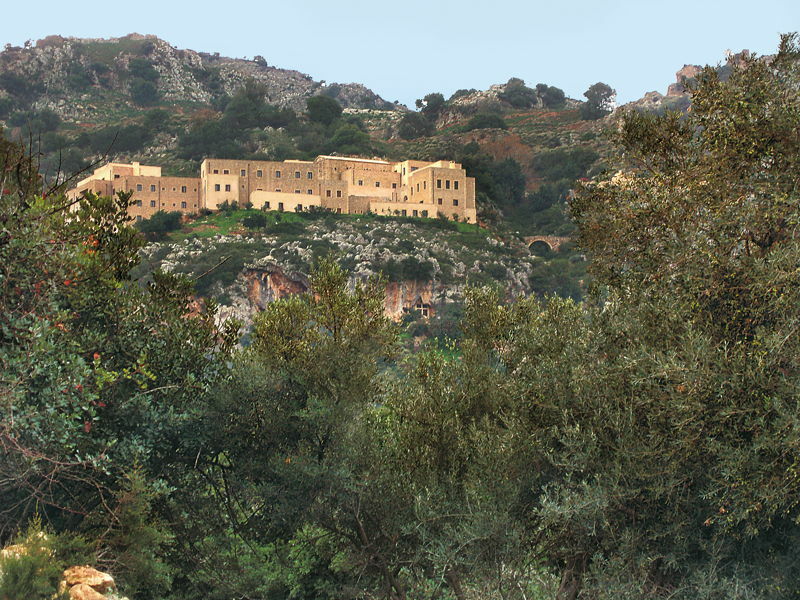 She restored the Holy Monastery of Chrysopigi from ruins, along with its miraculous icon of the Life-Giving Spring, and gave the monastery a spiritual foundation. 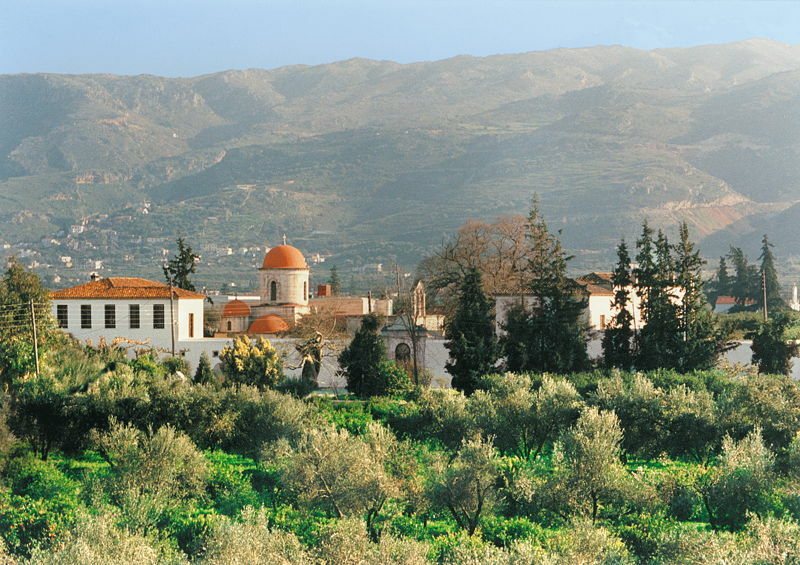 She also restored the neighboring monastic dependency, the Monastery of St. Kyriaki. In her final years, she sought a more deserted place for the sisterhood. She established the Monastery of the Transfiguration on a rock, under the fatherly care of the venerable Elder Porphyrios. At the age of forty-eight she became seriously ill with cancer and was miraculously cured by Elder Porphyrios, who had an especial love and respect for her. Ten years later, her sickness returned to her, during the four final years of her life. She accepted her sickness with great courage and perseverance, immense patience, gentleness, and deep peace, unceasingly fulfilling her duties until her final breath. Her end was a blessed one, as her life had been. She fell asleep in the Lord on the 31st of May 2000, at the age of sixty-two. Eldress Theosemni was a model nun, according to the teachings of the Fathers. In everything she did, she combined gifts that are seldom given, with great capability, on both the theoretical and the practical level. She was hard working and energetic, but simultaneously ascetic and hesychastic. By nature quiet and reserved in her relations with people, she was able to hide her great gifts and virtues even from the people around her, and to ascribe successes to others. Although she was very mature, organized, methodical, clever, and observant, she always managed to ascribe the result of any work to everyone involved, as though it was wholly a team effort. In this way, she taught the sisters not to seek after personal glory. The Eldress never believed in her many spiritual gifts. She was marked by a profound humility, not just simple “humble words,” or pietistic comeliness. She managed the monastery’s affairs without any discord. She had the discernment to know which sister should undertake any given job, or a particular responsibility, and made use of the talents of all. In whichever place or job in the monastery she provided oversight, she was observant enough to know what needed to be fixed or improved, and this always took place with propriety and with a quiet explanation. The Eldress herself took care of various jobs in the monastery, and did not limit herself to just the fulfillment of the duties of the abbess. She made good use of her time with remarkable creativity. When she realized that some aspect of the monastery’s work was running behind or was unsuccessful, she got involved herself, without getting upset or uptight, and with her remarkable simplicity saying, “let’s have a look, sisters, with patience, at what other way we can do this….” And, of course, she always found a solution. The Eldress had immeasurable respect for all of the sisters, and no one ever heard her speak in an offensive manner. Unless she was asked, she did not counsel anyone, and only infrequently would she give her nuns unsolicited counsel. And when she did, she would censure herself, saying that she was not worthy to teach. Let us have a humble spirit. May we be careful to never see the sins of others, only our own sins. We, however, want to fix other people, but don’t want to fix ourselves. Eh…does this happen, though? No, we don’t fix ourselves! Our brother is not to blame for whatever happens, our spiritual condition is to blame. It’s this condition of ours that upsets us, which makes us judgmental, which causes us to get angry. We mustn’t blame others for these things. The causes are within us. If we ever do or think something good, let us not regard it as our own achievement, but the achievement of God. And let us say, “You, my God, You gave it to me. It’s yours and You allowed it and gave me the strength to do it.” In this way, we chase thoughts of vainglory far from us. She had the spiritual gift to administer and direct the sisterhood without getting upset, without raising her voice, without having to check up on, or to threaten by giving her nuns a rule of penance. She generally did not give rules of penance. If she did it on occasion, she was very sad about it, which is why she would be the first to fulfill the rule of penance that she had given to the sister. As abbess, she never accepted special attention or honor. She carefully examined every part of the monastic life and did not ignore anything as though it were unimportant or too detailed. She never allowed herself to make changes, remaining always faithful to the spirit of the Fathers. It is characteristic that she never gave a blessing for a loosening of the fasting regulations unless such a loosening was indicated in the Orologion. Even when she was sick, she kept the fasting rules precisely. On one occasion, she found herself outside of the monastery at the very beginning of Great Lent, for radiation therapy, and she still kept the first three days of Lent with precision [a complete, strict fast], and then had the first round of radiation therapy on Wednesday afternoon of the first week of Lent, after the Presanctified Liturgy. During her whole period of sickness, despite the insistent requests of the sisters, she never asked for any specific kind of food, but accepted with thanks whatever food she was offered. The blessed Eldress Theosemni never protested for anything, to anyone. She regarded martyrdom and being crushed as part and parcel of the monastic life, with the certainty that God allows trials for our salvation. The Eldress would always cover over the failings of others, she never blamed anyone and never judged, criticized, or complained about someone who had done her wrong or had slandered her. She forgave and loved all people from her heart, effortlessly, which is why everyone felt at ease with her, despite her serious and careful demeanor. For her part, she did not feel as though she was doing anything more than fulfilling the obligations of a nun. Let us have love. When we reproach someone, we don’t love them. They will only understand through love, not through being gloomy, angry, and judgmental. We’re mistaken if we think that other people have wronged us. The problem is within us. Only let sweet words come from our lips. And if we don’t have anything to say, a smile suffices. Let’s gift others with our smile, with our love. When we don’t love our brethren, we don’t love Christ. It’s no good for us to say we love Christ if we don’t love our brethren. Humility is to make excuses for our brethren in all things and for all things. The humble person cuts off her own will. The Eldress struggled for the salvation of the whole world. She prayed unceasingly for the known and unknown, small and large, Christian and non-Christian, for all people. Most of our prayer should be for the world. We should pray, “Lord, Jesus Christ, have mercy on me,” but this “me” should refer to the whole world. If we pray for others, God gives us more grace than He would have if we were just praying for ourselves. And whatever good things we ask on behalf of others, God also gives to us. Let’s say the prayer continuously. This softens the soul. It makes it soft, so that it loves all people. All people seem good to it and nothing upsets it. Her serious long-term sickness was a source of pain for everyone else, but not for her. While she suffered, no one noticed any sadness or disappointment on her face or in her words because of the bodily trials and pains she suffered and endured. She continued her life with psychical strength, remarkable patience and meekness, courage and boldness, endless faith and obedience to the will of God. She continuously transmitted to everyone the joy and hope of communion with Christ, and the strength of the foretaste of eternal gifts, which her blessed soul experienced already in this life. My sisters, don’t be saddened that I’m sick. Think that whatever God gives is for our good. Whatever He allows is for our salvation. Whatever this is…and let us thank Him. Do you know what joy and what peace comes from thanking Him for all things, and from glorifying Him? Submit everything to God. This is the work of a nun: prayer for everything, for everyone. Haven’t you heard what Fr. Porphyrios said, “With joy, leave all things to God.” Let us have our minds constantly on Christ. This is the only way we will be patient in our sorrow and in whatever trials come to us. The peace that exuded from Eldress Theosemni’s face gave comfort to the insecurities of everyone and her peaceable speech was therapeutic for the souls of those who listened to her. Her whole life was a harmony of spiritual vision, teachings, and action. The Eldress incarnated the humility of the holy Fathers, which is why people near her experienced peace and an otherworldly joy, the same kind that we sense when we are near Saints. While still in this life, the blessed Eldress had already truly lived the foretaste of heavenly blessedness in silence and humility, and through her repose reconciled people with death. The people that came to Chrysopigi from Crete, from Greece, and from overseas, to pay their last respects and to venerate her relics, all witnessed to the same experience: they described the sweetness and absence of fear that they felt before her relics. The two days that preceded her burial were a touching experience, full of blessings for everyone, not only for those that knew and loved her, but also for the whole Church. Parents who had lost young children in tragic accidents described with tears how, for the first time, they felt comforted. Others touched their infants to her, as they would to the relics of the Saints. Children both young and old approached her coffin and touched her again and again without fear, for they saw her smiling, as she had unceasingly smiled even when in pain. The funeral of the blessed Eldress was uncommon. It was a triumphant funeral service, a revelation for everyone, a tangible revelation of the mystery of sanctity. There was no despair and sadness, but victory over death, the joy of the Resurrection. A young person said, “It’s like Holy Friday when we bury Christ with the certainty of tomorrow’s resurrection.” Everyone felt that the reposed Eldress Theosemni had passed to heavenly blessedness from a life in which she had had a foretaste of, and had grown accustomed to, the joyful feeling of immortality. She had experienced this to such an extent that she was able to communicate psychical comfort and the overcoming of sorrows to everyone, along with the reality of the approach of eternity. The blessed Eldress Theosemni departed in light from the present life, during which she had lived within the perspective of the future age. Her grave had become a source of consolation, hope, and an education in eternal blessedness, not only for the nuns of her monastery, but also for all of the pilgrims, known and unknown, who thronged from near and far. And a story, well-known to the Church, was repeated: of how a person who lived in obscurity and silence became a preacher, an inspirer, and an initiate, not of human words and actions, but of the mystery of eternity.